Artwork and illustrations alone cannot sell a roleplaying game, but whether great art or signature art, it can help sell a roleplaying game. From Warhammer Fantasy Roleplay and SkyRealms of Jorune to Legend of the Five Rings and Mouseguard as well as supplements such as The Book of Unremitting Horror and Green and Pleasant Land, the artwork in these roleplaying games supplements do more than illustrate places, people, monsters, and things. They capture the feel and tone of their respective settings, they impart a sense of wonder or of horror, and they entice the reader—or viewer—into wanting to explore their respective settings as described in the accompanying text. One recent roleplaying to be lauded for its consistently evocative artwork is Symbaroum. Originally published by Järnringen, but now published by Free League, and distributed by Modiphius Entertainment, this Swedish roleplaying game takes place on the edge of civilisation and beyond. The civilisation is the young kingdom of Ambria, barely two decades old, it was founded on the ruins of the ancient and long-lost empire of Symbaroum as the refuge for the survivors fleeing north over the mountains from the Kingdom of Alberetor as it fell to an onslaught from the necromantic Dark Lords. The edge is where the barbarian tribes and goblins make their lives, the beyond is the Davokar Forest, an endless tract of thick woodlands into which treasure hunters venture, hoping to learn its secrets, locate long lost ruins of Symbaroum, and perhaps return with treasures of the past that will make them rich. From the core rulebook and The Copper Crown to the more recent Thistle Hold – Wrath Of The Warden and Karvosti – The Witch Hammer, the Symbaroum line has been greatly praised for its artwork. Whether it is illustrating the majesty and mystery of the forest under the eaves, the dark and desperate nature of life in Thistle Hold—Ambria’s primary frontier town, the magnificence of the Titans, the mountain range which divides Ambria from Alberetor, the great elemental beasts and the Elves of the season that step out of Davokar to attack and menace Thistle Hold, and the characters—the various types that the players will roleplay in the game, what comes across in Symbaroum is its dark and brooding atmosphere, its fear of the unknown, and the fraught nature of life on the frontier. Fully painted by artist Martin Grip, now much of that artwork has been collected in The Art of Symbaroum. The Art of Symbaroum comes as a handsome cloth-bound square hardback, just eight-and-a-half inches square, its content printed on glossy paper against a rich black background. 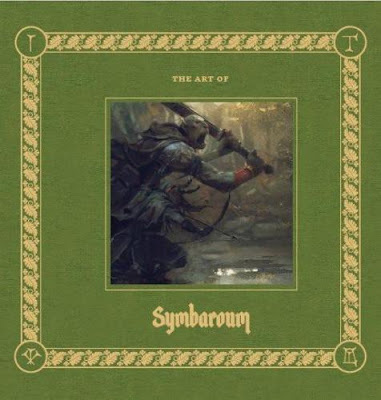 It contains just four chapters—the numbers subtly matching the runes on the front cover—‘Symbaroum’, ‘Ambria & Davokar’, ‘Creatures’, and ‘Covers’, across which are presented some seventy or so paintings. Images in ‘Symbaroum’ hint at the grandeur and scope of the ruins of the fallen civilisation and the strange threats that linger, such as the noble spiders and their master, the ruthless warlord known as the Spider King. ‘Ambria & Davokar’ takes the reader from the civilisation of as yet unexamined Ambria, via the rude settlement of Thistle Hold with its infamous arena—as detailed in Thistle Hold – Wrath Of The Warden—out under the fecund eaves of the forest. It includes images of the Titans, the mighty mountains that provided an escape route out of fallen Kingdom of Alberetor, as well as those of the stronghold of the High Chieftain—inside and out—which counter any suggestion that the barbarians are uncultured. ‘Creatures’ includes not beasts and monsters, but also persons. Rounding out the seemingly slim volume—at over hundred pages, it is not actually all that slim—is ‘Covers’, which presents the covers used to grace the front of various sourcebooks and supplements for Symbaroum. Of course, they are what attracted us to the game in the first place and so it is good to see them here, free of titles and logos. Many, but not all of the paintings are accompanied by short pieces of text. These include snatches of poetry and portents as well as anecdotes from treasure hunters and adventurers who have ventured into Davokar and elsewhere. These add a little flavour and complement the artwork without getting in the way of it. Above all though, The Art of Symbaroum is a lovely art book, full of evocative, brooding, beautiful artwork. The paintings of Martin Grip do not just showcase the setting of Symbaroum, they are a part of Symbaroum, and it is a delight that the publishers should recognise this by releasing The Art of Symbaroum.